Laura Garofalo is a Ph.D. candidate in the Interdepartmental Program in Classical Art & Archaeology. Her primary interests are in the intersections of Roman history, art, and archaeology. Laura is currently writing a dissertation on retrospective styles in Flavian Rome. Detail of the pottery stamp. 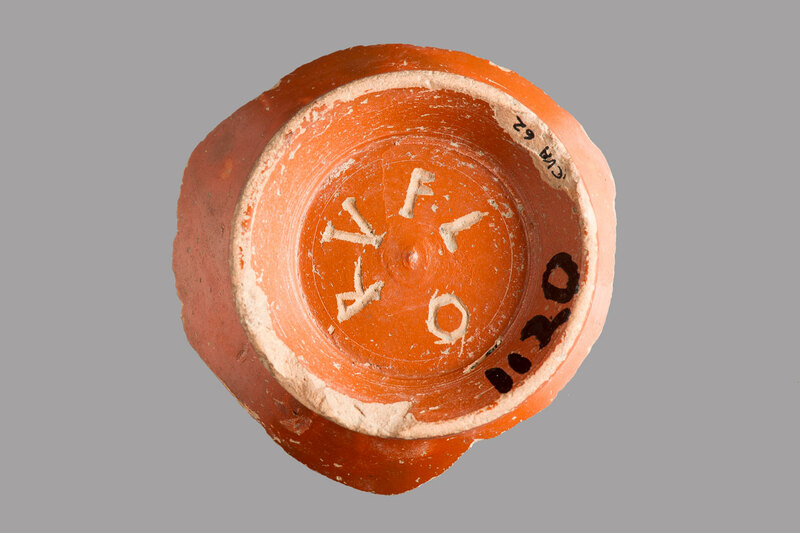 This ceramic base of a bowl features a deeply incised graffito which reads “FLORV,” perhaps short for the name “Florus.” This type of graffito might have been used to identify the owner of the vessel or may have been used as a trade marking. 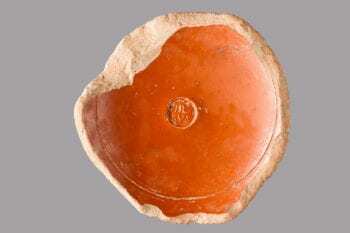 The interior of the vessel features a round stamp with a potter’s mark, “HILA / RVS.” At least three central Italian pottery workshops have names with ‘Hilarus’ attested, but no known pottery stamp exactly matches this one.Parts of the sides of the vessel are also still visible, suggesting the curvature of the walls. Robinson, D.M., ed. 1936. Corpus Vasorum Antiquorum: United States of America, The Robinson Collection, Baltimore, MD. 3 vol. Cambridge, MA: Harvard University Press. Pg. 56-57, no. 4a-b, pl. XLIV, 4a-b.